Dermoscopy has also been referred to as: surface microscopy, direct skin microscopy and light microscopy. This diagnostic procedure uses a dermatoscope to evaluate moles and lesions at close range. 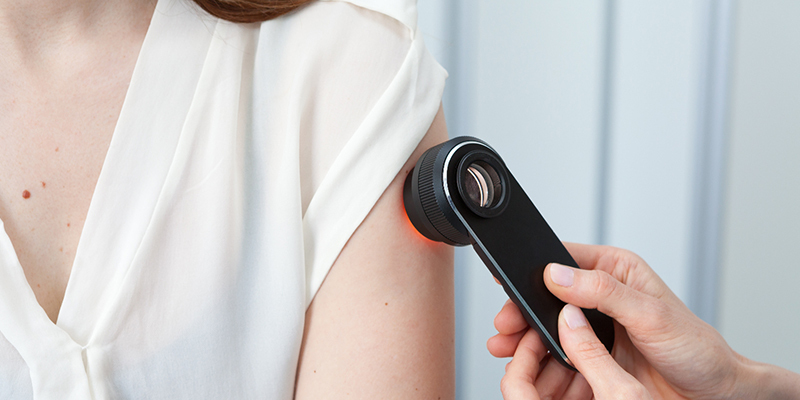 A dermatoscope offers physicians 10 times greater magnification of the lesion and a light source for enhanced viewing of the skin during the diagnostic process. Dermoscopy will not diagnosis skin cancer on its own; a physician will order a biopsy of a lesion if there is suspicion of skin cancer. In the right hands, dermoscopy can act as an aid in identifying cancerous lesions, pre cancerous lesions, and melanoma on the skin. Dermoscopy can be performed by dermatologists or general practitioners with special interest or additional training in the procedure. The benefits of having a skilled eye look more closely at specific lesions include earlier diagnosis of melanoma in situ and other potentially harmful skin cancers. Additionally, physicians may use this method to distinguish benign lesions from malignant lesions, resulting in a reduced occurrence of surgical removal and biopsy for non-threatening skin peculiarities. SCARS Center dermatologists specialize in identifying the warning signs of malignant and precancerous lesions. Schedule an appointment for your regular skin check today.